The New York Yankees hold down first place in the American League East, however that will be only one the things they will have on their minds as Boston comes to town for consequential four-game series. New York is 0 for 2009 against the Red Sox, having lost eight games to them and they fully realized many more losses could cost them coveted division crown. After playing sloppy baseball the first three games in Chicago, New York won the last contest against the White Sox and swept Toronto 2-0, including taking down Yankee-killer Roy Halladay. 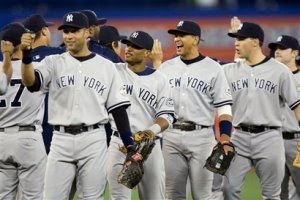 This has to give Girardi’s club a mental boost and they are 14-2 after six or more consecutive road games this season. Boston (62-44, +3 units) limps into the Big Apple, after losing two to Tampa Bay, falling further behind the Bronx Bombers and letting the Rays narrow the gap for wild card to three games. The Red Sox offense has been inconsistent all season on the road, scoring 4.8 runs per game, but tending to do it bunches. This accounts for 27-27 record and they are only 18-29 playing against a team with win percentage of 54-to-62 percent in the second half of the season since last year. The Yanks Joba Chamberlain (7-2, 3.58 ERA) by contrast has been amazingly effective. He’s come up with several big performances when New York has needed them and in last three starts, he has 0.83 ERA over 21 innings, surrendering just eight hits, posting three wins. Chamberlain and his pin-striped teammates are 14-3 in his last 17 starts in the Bronx. Sports bettors are pounding the money line at Bookmaker.com on New York, now up to -200 after opening at -170, with the total relatively stable at Un10. The Red Sox should have confidence based on this year’s results and are 22-7 vs. AL teams scoring 5.2 or more runs a game on the season. New York returns home feeling much the same way on three game winning streak. The Yankees are 20-6 off a victory and have won 27 of last 37 encounters. They have had their way with right-hand starters with sensational 17-4 record. First pitch is set for 7:05 Eastern and though public perception is these rivals always play high-scoring games, they are 9-9 against the total playing in New York.